With all the actors out there directing movies, it’s hard to believe that Quartet marks the directorial debut of Dustin Hoffman. Hoffman has directed a stellar cast of mostly older actors in this moving and very real story. 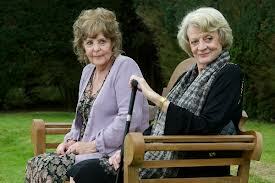 Maggie Smith stars as Jean Horton, a retired opera singer. The rest of the cast is noteworthy and memorable, but this movie belongs to Smith. Jean is forced by circumstances to leave her home and enter Beecham House, a retirement home for performers. She is not happy to be there, especially since one of the residents is her former husband. Jean and Reggie were half of a famous operatic quartet that performed a noted version of Giuseppe Verdi’s Bella figlia dell’amore from Rigoletto. Each year the residents of Beecham House produce a concert in honor of Verdi’s birthday. Now, with the arrival of Jean Horton, they wish to perform this beautiful piece. For many reasons, Jean is reluctant to do this, and that is the central plot of Quartet. Many of the actors in the film are retired stage performers. The viewer has the privilege of watching and listening to them do what they do best. Time has taken its toll, but they all are talented and accomplished. There is some original music in this film, but most of the music is familiar operatic pieces. I was especially happy to see the closing credits included photos of some of the actors in their prime. Kudos to Dustin Hoffman and the entire cast of Quartet! We saw two movies this week, and this is a quick post to try and catch up. I’m also reading two books right now, and I’m definitely falling behind everywhere! The first movie we saw was Promised Land, starring Matt Damon, Frances McDormand and John Krasinski. Krasinski and Damon share the screen writing credit in this new movie directed by Gus Van Sant. This is the story of two consultants (Damon and McDormand) for a company which engages in hydrofracking for natural gas. They are deployed to a rural Pennsylvania town with the assignment to obtain leases from the residents extract gas from their lands. The company believes there is a large reserve of natural gas in the area, and wants to be the first to tap into it. John Krasinski shows up on the scene as an environmentalist determined to stop them. This movie is fairly predictable. The performances are low-key, and most of the characters seem true to life. My only quibble is that is seemed preachy; it’s obvious where the filmmaker’s bias lies. We don’t need to be hit over the head more than once about the evils of fracking. 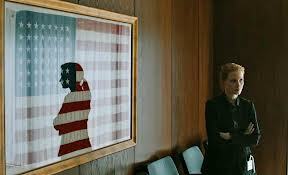 The second movie we saw was the stunner Zero Dark Thirty. This gritty film is about the post-9/11 hunt for Osama bin Laden. The focus is on Jessica Chastain’s character Maya, a young CIA agent who becomes obsessed with following one particular lead in the search. Everyone knows the end of this story; a team of Navy SEALS is deployed to a small city in Pakistan one night in May 2011. They kill bin Laden, and take his body out with them, along with the contents of several computers and file cabinets. But the movie focuses on how they got to that point. There are scenes of detainee torture, as well as of attacks on Americans. We see the bureaucrats at the CIA who seem unable to make a decision to recommend to the President that they proceed with the operation to kill bin Laden. They spend months trying to be certain that bin Laden is actually at the location that Maya has pinpointed. In addition to Chastain, I thought that the performance of Jason Clarke as Dan, a veteran CIA agent, was fantastic. The characters of Maya and Dan have depth and believability. Unlike James Gandolfini. As the Director of the CIA, he stretches credibility. I think he is too identified with characters like Tony Soprano to play that type of role. But that was the only weak point in this movie, and it’s a minor one. I’m surprised that Director Kathryn Bigelow was not nominated for an Oscar; there were a lot of very good movies this year, but she should have been singled out for at least the honor of the nomination. 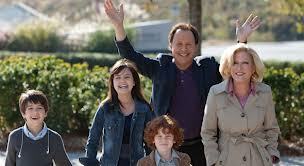 I was delighted to see Parental Guidance, the movie starring two of my favorites, Billy Crystal and Bette Midler. They play Artie and Diane Decker, a middle-aged married couple living in Fresno, California. When Artie and Diane receive a phone call from their daughter Alice (Marisa Tomei), they are surprised that she asks them to babysit her children for a week. Alice and her family live in Atlanta, and the Decker’s have not been close to their grandchildren. Diane jumps at the opportunity to be a part of the lives of her grandchildren, but Artie goes along reluctantly. The grandparents, especially Artie, are classic “fish out of water” in the Simmons household. The house is totally high-tech; it is a prototype of a new smart house, developed by Alice’s husband Phil. Artie and Diane are totally overwhelmed by the technology. They are also confounded by the child-rearing principles espoused by Alice and Phil. Artie and Diane are classic old-school parents-down to earth and not afraid to say what they think. Alice and Phil, on the other hand, are modern perfectionist helicopter parents, with unrealistic expectations for their childrens’ behavior. 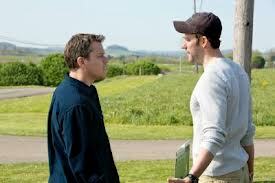 And this clash of styles is the basis for this very funny, if a bit predictable, movie. Parental Guidance is funny and heart-warming, and there may even be a few teary moments. It is suitable for almost all ages-the children are cute and charming, the parents overwrought, and the grandparents inept but willing to learn. In June 1939, King George VI and Queen Elizabeth became the first reigning British monarchs to visit the United States. The purpose of their visit was secure a closer relationship with the United States. They knew they would soon be at war with Germany, and they needed the support of the American people and the American government. For part of their visit, the monarchs were guests of President Franklin Delano Roosevelt at his home in Hyde Park, NY. Hyde Park on Hudson is the story of that visit-from the frantic preparations to the dinner welcoming the royals and to the picnic which featured King George being served a hot dog. This story of international significance is anchored by a smaller, more personal story. As the movie begins, FDR begins an affair with Daisy, a distant cousin. Daisy is from a poorer branch of the Roosevelt family. She lives in the area with an elderly aunt, for whom she is caretaker. Daisy is flattered by the attention from her distinguished cousin. She is excited to be surrounded by the hustle and bustle of the “Summer White House”, as FDR’s Springwood estate was considered.Daisy is at FDR’s beck and call. When he arrives in Hyde Park, he calls for her. When he is not there, she returns to her previous life, caring for her aunt. Bill Murray is a convincing FDR. He is a confident and consummate politician. Laura Linney does a fine job playing the self-effacing Daisy. But Samuel West and Olivia Colman really bring to life the King and Queen. They are perplexed at many of the things they encounter in Hyde Park. They are not sure if the Americans are trying to insult them, or are just oblivious to the affect that American informality and humor have . This movie is only being shown in a few theaters. If it’s playing near you, I would definitely see it soon. Bill Murray has been nominated for a Golden Globe award for Best Actor for his portrayal of FDR; perhaps if he wins it will keep this film around a bit more. Director Tom Hooper’s movie version of Cameron Mackintosh’s Broadway (and everywhere else) spectacular musical Les Miserables is an amazing film. Since I’m guessing that nearly everyone on the planet knows the story, I won’t rehash that. But I will say that this movie is an amazing accomplishment. Hooper has taken a familiar tale, and made it better and larger than life. Because the film is not confined to the size of the Broadway stage, there are no limits to the visual impact of many of the scenes.The opening scene shows Hugh Jackman’s Jean Valjean serving prison time at hard labor. He and other prisoners are hauling a huge ship into a harbor in the pouring rain. The prisoners are watched over by Russell Crowe’s Inspector Javert, an uncompromising and unforgiving man. This opening scene shows us the vast scale of human suffering in a way not possible on the stage. As surely everyone on the planet also knows by now, this production is entirely sung. Unlike other movie musicals, it was not pre- or post-recorded, but filmed as the actors were singing. This gives the film the realism that most musicals lack. Most of the actors in Les Miserables are not known for their singing voices. There are many singers out there with better voices. But the emphasis here is on the acting, which is only enhanced by the sometimes rough and relatively untrained singing voices. The casting is brilliant. Only Jackman and Crowe are in the entire movie, so the other performances are relatively limited, but are none-the-less stunning and moving. The hair, make-up and costumes seem over-the-top and theatrical, but they do not detract from the gritty reality of the story. I was concerned that Sacha Baron Cohen and Helena Bonham Carter would be their usual caricatures as the innkeeper Thenardier and his wife, but here they did not stand out as such. This movie is very long by today’s standards (over 2-1/2 hours). We went to a 12 noon showing so we brought sandwiches and drinks with us-a good idea if I do say so myself! Last month Jay Weston in the Huffington Post proclaimed Les Miserables as possibly the best movie he’s ever seen. I’m still thinking about that, but it is a stunning accomplishment. Bring the snacks, bring the hankie, and absorb one of the most original productions to come along in a long time. This has been a busy movie weekend for us! We actually saw Life of Pi last night since Lincoln was sold out. So off we went this morning to see the earliest showing of Lincoln. In making this film, director Steven Spielberg and writer Tony Kushner decided to focus on a small portion of Abraham Lincoln’s presidency. In January 1865, the Civil War was winding down. Lincoln had just been re-elected to a second term, and his popularity was soaring. The Thirteenth Amendment to the Constitution had previously been ratified by the Senate, but it needed approval by a 2/3 majority of the House of Representatives in order to be enacted. In early January, Lincoln gave his Cabinet the mission of persuading the members of the House (including many lame-duck Democrats) to pass the amendment by the end of the month. The task fell mostly to Secretary of State William Seward (later best known for engineering the purchase of Alaska from the Russians). Seward authorized his minions to do nearly anything to secure the necessary votes. Their most promising form of persuasion was in the form of government jobs at the conclusion of Congressional terms. The machinations of Lincoln and Seward are interspersed with the everyday life of the Lincoln family, as well as scenes from the War. Many of the War scenes are brutal and graphic, and not for the faint of heart. Since we know of Lincoln’s fate, the vignettes of the Lincoln family daily life are poignant and sad. Spielberg has assembled a most outstanding cast. Daniel Day-Lewis, Sally Field, David Strathairn, Hal Holbrook, Tommy Lee Jones; the list goes on. All of them deliver stellar performances in this stunning film. And as a bonus, the iTunes store has available for free downloading a short book about the making of the film, with interviews from the major players who made this film happen.